A doll of Central American migrant, part of a caravan trying to reach the U.S., is pictured along the highway to Arriaga from Pijijiapan, Mexico, Oct. 26, 2018. The United Nations children's fund (UNICEF) reports an estimated 2,300 children in Mexico traveling toward the United States are suffering extreme hardships because of the heat, lack of basic services and multiple dangers on the way. The children are part of a caravan carrying some 9,300 refugees and migrants toward the U.S. border. The voyage is long, extremely hot and dangerous. 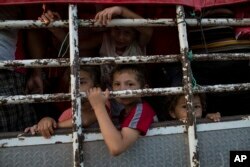 UNICEF said the journey is particularly tough on the children. A young migrant, traveling with a caravan of thousands from Central America en route to the United States, sleeps atop baggage resting on a stroller while looking to go to Arriaga from Pijijiapan, Mexico, Oct. 26, 2018. The U.N. agency said the temperature in southern Mexico is dangerously hot. Many children are ill, others are suffering from dehydration and trauma. All lack access to essential services including health care, clean water and sanitation and shelter. In addition, UNICEF spokeswoman, Marixie Mercado, said the need for protection is great. She noted that many of the children and their families in the caravan are fleeing gang and gender-based violence, extortion, and poverty in their home countries. Children travel on a cattle truck, as a thousands-strong caravan of Central American migrants slowly makes its way toward the U.S. border, between Pijijiapan and Arriaga, Mexico, Oct. 26, 2018. She said they have embarked on this dangerous journey from Honduras, Guatemala and El Salvador in search of asylum and in hopes of improving their lives. "While those traveling with the caravan hope for safety in numbers, the perils of using irregular migration routes remain significant, especially for children," she said. "The journey is long, uncertain and full of danger, including the risk of exploitation, violence and abuse." Mercado told VOA the children, regardless of their migration status, are guaranteed certain protection rights under international law. She said governments are obliged to abide by them. Norlan, 18, a migrant from Honduras en route to the United States, rests in a public square as he waits to regroup with more migrants, in Tecun Uman, Mexico, Oct. 26, 2018. "That means that it is essential that all children and families are able to apply for asylum and that they are able to have their international protection rights addressed before any decision on returns or deportations are made," she added. Meanwhile, Mercado said UNICEF is working with the Mexican government and other partners to make sure uprooted children receive the support and services they need. This, she said, includes providing children with nutrition, protection, and psychosocial support to help them deal with abuse they may have encountered along the migratory route.